He was our late grandfather, and was known all across the land for his closing of the Worldwound. He was a holy paladin of Sarenrae and he has become a legend among paladins, clerics, and anyone who has ever cast a spell or slain an undead in the name of Sarenrae. 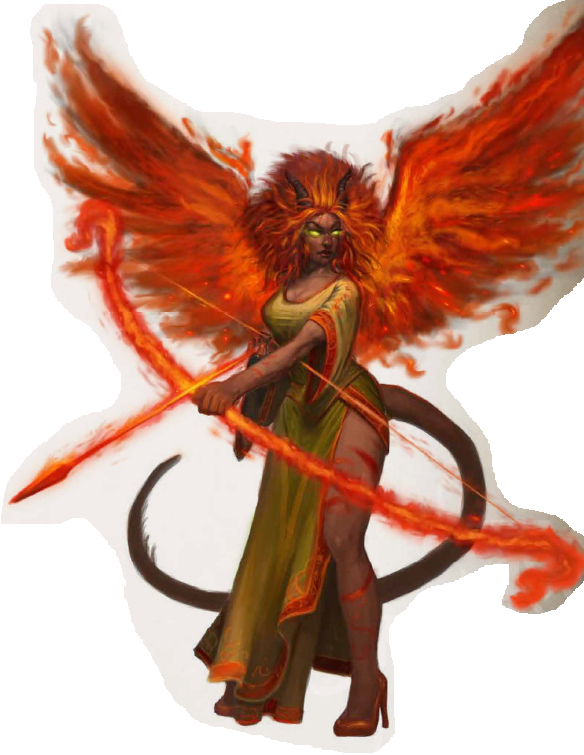 I am Calypso, a cleric of Sarenrae, and I have large wings, steel-like skin, and silver eyes. My sister Erynis and I are Aasimars, meaning we are part celestial. When we were young, we went to an order of monks of Sarenrae and trained to be clerics. One day when we were about 23, there was a raid by a group of marauders, and most of the monks were killed. They were having their monthly Day Without Talk, and were meditating, when they struck. The village guardsmen tried to get us to safety in the jungle. But, unluckily, we got ambushed. They struck down the guardsmen, causing chaos in the villagers. My sister and I were separated while the panicking villagers were cut down. A new sensation came across me as one of the attackers charged. My hands let out a cone of fire, charring him to a crisp. With a battle cry, what was left of the guards charged and slaughtered. I wasn’t done yet. I ran into the temple to finish the barbarians off. As I made my way to the main common area, I spotted three of them all sitting around a table talking. I realized that one was their leader based on the way he was dressed and how he had such a commanding aura. I called upon my newly found strength in fire and poured all my energy into a blast of fire that flew from my hands like a hail mary. It got in the middle of the men and lit two on fire, while the third was hit square on and fell back moaning. I felt a vengeful fury descend over me and tried it again. The fire came out even larger and stronger than before and hit the other two, whom were trying to staunch the flames on their leather vestments. They fell screaming, then stopped and just lay there silently. I suddenly fell to my knees, overwhelmed with emotion. I had just had a calling, to strike down all evil in the world, and to fight and heal until there wasn’t even a recollection of evil in anyone’s mind. And so forth, I went, and found a group of adventurers, including my sister, whom i hadn’t seen since that fateful day, and joined them in their adventures, and that’s how Erynis and I hijacked a boat from a slave group and set out to Port Shaw.